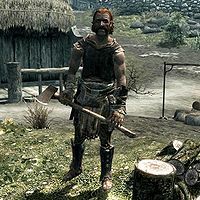 Horgeir is a Nord lumberjack and the owner of the lumber mill in Dragon Bridge. He lives at his house with his wife, Olda, and his brother, Lodvar. Horgeir wears iron armor, boots, and gauntlets during the day, and a belted tunic to sleep in at night. He carries an iron war axe, the key to his house, and a Lumber Camp key, as well as some common items and gold. He has constant disagreements with his wife, whom he calls "the most spiteful shrew in all Skyrim." According to him, his mill's business is booming due to the civil war, but Olda describes their situation as "deep in debt". If you speak with Faida at the Four Shields Tavern, she'll comment on Horgeir and Olda's relationship: "Poor Horgeir. Everyone in town knows about his wife's affair but him. Probably better if he doesn't know." This page was last modified on 18 September 2013, at 11:38.